WASHINGTON (CNN) - Two upper Midwestern states where Democrats hope to rebound in November's midterm elections after losing ground to President Donald Trump in 2016 selected their candidates in a slew of major races Tuesday. In Wisconsin, perhaps Trump's most surprising victory, Democrats selected state schools chief Tony Evers to take on Republican Gov. Scott Walker, CNN projects, in the party's fourth -- and likely best -- shot at defeating him. Republicans, meanwhile, chose state Sen. Leah Vukmir, a darling of conservative talk radio and the Walker-led state GOP establishment, to challenge Democratic Sen. Tammy Baldwin. 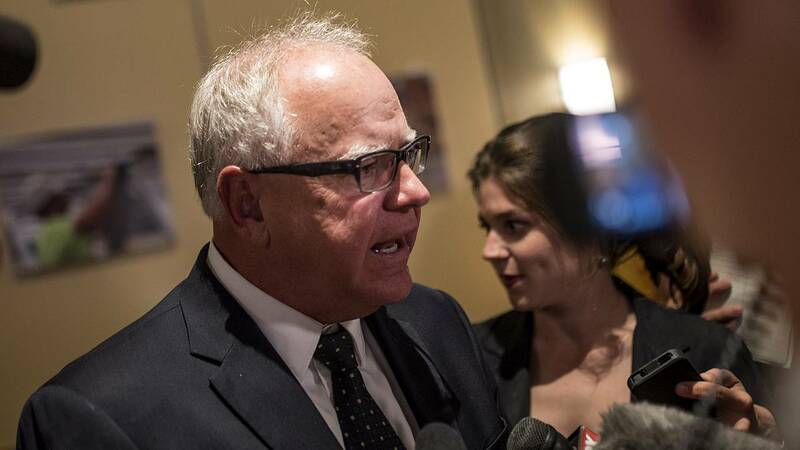 In Minnesota, Democrats nominated Rep. Tim Walz for governor, CNN projects. Republicans, meanwhile, shockingly rejected former governor and 2012 presidential aspirant Tim Pawlenty's comeback bid, instead tapping Hennepin County Commissioner Jeff Johnson, CNN projects. The two states will join Ohio, Michigan and Illinois on the list of Midwestern battlegrounds with governor's offices on the ballot this fall that Democrats believe they can win. Those primary wins came on a night that Vermont Democrats chose the first transgender gubernatorial nominee for a major political party, Minnesotans selected a congressional candidate who is likely to become one of the first two Muslim women in Congress and Connecticut nominated a former National Teacher of the Year, Jahana Hayes, for the House. Christine Hallquist will win her Democratic primary in Vermont, CNN projects, becoming the first transgender gubernatorial nominee for a major political party. Her victory is a breakthrough of both substantial and symbolic importance for LGBTQ Americans, in particular the trans community, which has for so long been shut out of the highest levels of elected office. After outlasting a field of four Democratic hopefuls, one of them a teenage boy, she will now take on Republican Gov. Phil Scott, who will survive his GOP primary challenge, CNN projects. CNN projects incumbent Sen. Bernie Sanders, an independent who caucuses with the Democratic Party, will win the Democratic nomination in Vermont. As he has done previously, he is expected to decline the party's nomination and then run as an independent in the general election. Unlike Wisconsin, Minnesota hasn't totally slipped out of the grasp of the Democratic-Farmer-Labor Party -- but the question is how long the party can hold onto power there. Already, the GOP controls the state House and Senate. Trump finished less than two percentage points behind Hillary Clinton there in 2016, raising fears from the left that with a comeback by Pawlenty, the former Republican governor, the state could soon be ruled exclusively by Republicans for the first time in a half-century and face the same sorts of policies, like the union-busting stripping of collective bargaining for public employees, that Walker enacted next door. Democrats chose Walz over state Rep. Erin Murphy and Attorney General Lori Swanson, who was the best-known candidate. Swanson's campaign faced a late controversy over The Intercept's report in which former staffers said she had pressured those working in the attorney general's office to also perform campaign work -- charges Swanson has denied. In the Republican primary, Pawlenty had been expected by national party strategists to sail to the GOP's nomination. But Johnson, the 2014 nominee, won the state party's endorsement when Pawlenty skipped the convention, and offered himself as a more Trump-like option. The most significant grip on power that Wisconsin Democrats have is Baldwin's seat. There, Republicans nominated Vukmir over businessman and veteran Kevin Nicholson. What drew national eyes to the race is that Illinois businessman Richard Uihlein has pumped nearly $11 million into groups supporting Nicholson -- making for a highly unusual tie between a politician and his corporate benefactor. Baldwin has held a clear lead in recent public polls, but Republicans have long believed that the Walker-built political machine and the state's rightward drift could make her a surprisingly ripe target in November. Ironworker Randy "Iron Stache" Bryce, an internet sensation who sought to challenge House Speaker Paul Ryan before Ryan announced his retirement, defeated teacher Cathy Myers, CNN projects, in what's been a bitter contest locally for the 1st District Democratic congressional nomination in Wisconsin. Other key House primaries Tuesday come in Minnesota's 1st and 8th districts, perhaps the two most endangered seats currently held by Democrats on the map. Both incumbents are leaving to run for higher office. Rep. Keith Ellison, the Democratic National Committee deputy chair and a favorite of Bernie Sanders' backers, won the Democratic nomination to become Minnesota's next attorney general, CNN projects, positioning him to fight the Trump administration in court. His win comes despite accusations over the weekend from Ellison's ex-girlfriend of domestic abuse, which he flatly denied. In the race to replace Ellison, Democrats nominated state Rep. Ilhan Omar, CNN projects, a Muslim Somali-American progressive woman who is backed by Alexandria Ocasio-Cortez. Since both come from safe districts, she is likely to join Rashida Tlaib, who won a congressional primary in Michigan, as one of the first two Muslim women in Congress.